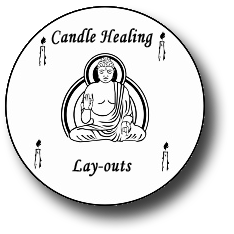 For the following candle healing layouts use colored candles for self-healing or on your clients. 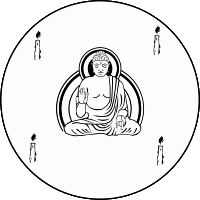 This healing technique can be used on its own or with any other holistic system. In candle healing layouts the flame of the candle represents the source of our creation, your inner light. It speaks to us of the soul spark that is above and below, within and without, that which links us all together originating from the same source of thought consciousness. Candles and sacred flames are part of the myth and mystery of humanity's experience in the physical, always a reminder of our connection to source. Which Layout Do I Use? The Triangle is an amplifier, it increases the power of healing force of whatever colour you are using. The Square stabilizes the entire physiological systemof an individual, calming,settling, grounding and focusing the basic life force of the colour being used. The Cross balances and aligns. The Six-rayed Star links the mind and heart foroverall healing. The Seven-rayed Star is the most healing of the layouts and is especially good for children. It balances and aligns the Chakras so that the healing colour can do its work most effectively. Aries (March 21 April 20) Ruling planet - Mars. In candle healing layouts, shades of red, usually the darker shades of scarlet or crimson works well for general healing with Aries. Magically the planet Mars is the purifier and destroyer who sweeps aside the stagnant, the unwanted and the redundant so progress can be made. Red also represents the creative principle and the unconscious urge for the human species to reproduce itself, for life and death are two aspects of the same energy. Taurus (April 21 - May 21) Ruling planet - Venus. Green, ranging from the palest apple green to the dark olive of the earth forces. Green represents the spiritual desire to unite the opposites and to balance the dual forces of male and female. This union was known to the medieval alchemists as "the sacred marriage" and is symbolized in magic and Wicca by the ritual metaphor of the sword in the chalice. Gemini (May 22 June 21) Ruling planet - Mercury. Yellow is the color of this Zodiac sign representing communication and the power of the mind. In occult tradition Gemini is a symbol of the dualism. Cancer (June 22 - July 22) Ruling planet - the moon. Metallic blue and silver are the colors of the lunar sphere. It is the realm of the unconscious, the hidden side of the personality and psychic forces. Leo (July 23 - August 23) Ruling planet - the sun. Its colors are gold and orange. The sun represents the life force and is the visible symbol of the Cosmic Creator in the solar system. Virgo (August 24 - September 23) Ruling planet - Mercury. When using candle healing layouts a reddish-yellow is the color associated with the analytical abilities of the mind in the quest for scientific knowledge & can be used for general healing with Virgos. Libra (September 24 - October 23) Ruling planet - Venus. Libra's colors are sky blue and rose pink and work very well for general healing when used in candle healing layouts. It symbolizes the heights attainable by romantic and spiritual love. Scorpio (October 24 - November 22) Ruling planet - Pluto. Dark red or silvery gray. The energy of the Plutonian sphere is connected with Mars and represents death and regeneration. Pluto rules over the underworld, the spirits of the departed and nuclear power. Sagittarius (November 23 - December 21) Ruling planet - Jupiter. Purple and royal blue are the colors of this Zodiac sign. It is an expansive planetary energy connected with the world of finance and social matters. Capricorn (December 22 January 20) Ruling planet - Saturn. Black is the primary color of the saturnine energy. It rules karma, fate and destiny, the law, old age and property matters. Aquarius (January 21 - February 19) Ruling planet - Uranus. The color of this astrological sign combines all the shades of the spectrum in a flashing rainbow pattern. This planetary energy is a higher octave of Saturn and rules over magic (forces, astrology and modern technology like television, video and computers). Pisces (February 20 - March 20) Ruling planet - Neptune. Indigo is the color of Pisces, which is connected with the planetary energy of Jupiter. Neptune rules over inspiration, matters connected with the sea, pleasure, and entertainment, especially the movie industry.